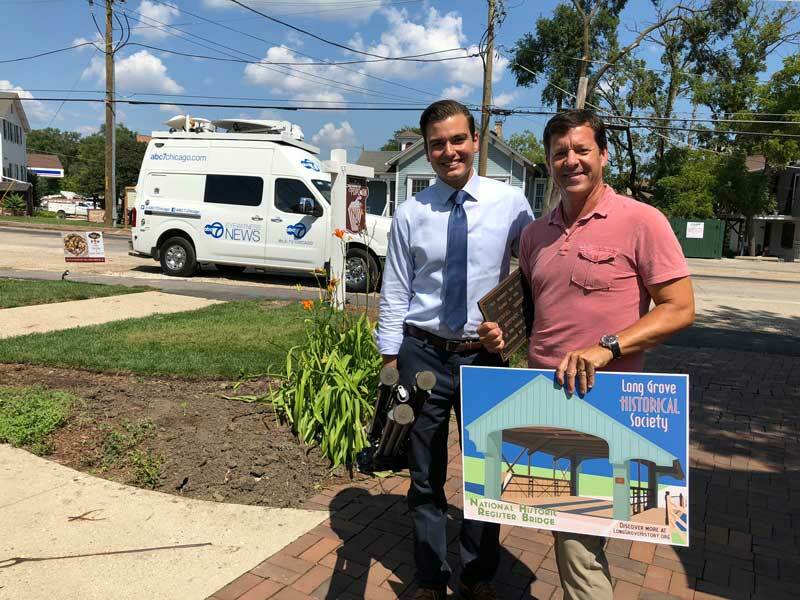 News reporter Mark Rivera stands next to Aaron Underwood (holding the bridge poster) after spending the morning in Long Grove on August 22nd. Having Robert Parker Coffin Road closed to traffic at the bridge for two months now has caused inconvenience to residents and hardship to the downtown businesses. Everyone agrees that it is a priority to get the road opened again. The most historic parts of the bridge, the metal truss and walkway and the foundations, are in the same condition as prior to the accident. The damaged wooden cover needs to be either demolished and rebuilt or repaired. The Village engineers have recommended demolition and reconstruction, and the insurance company has proposed repairs to what is currently left. The Village Board will be weighing these options at their next meeting this coming Tuesday, August 28th. If the cover is removed, the Village Board is also considering making other long-term needed repairs such as repairing or replacing the limestone abutments. Because the bridge is a historic structure, the Village has recently become aware of potential federal funding that could help with the costs of restoration up to 80%. However, details and availability of this funding option have not yet been confirmed. Stay tuned to see how the decisions unfold in the months to come. 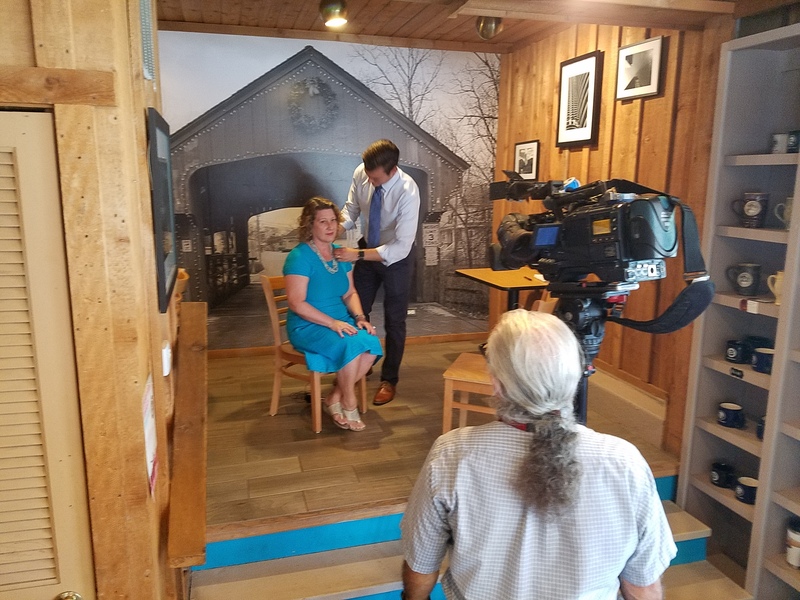 Lining up the camera shot and getting miked for my interview with ABC Channel 7’s Mark Rivera inside the Covered Bridge Creamery. 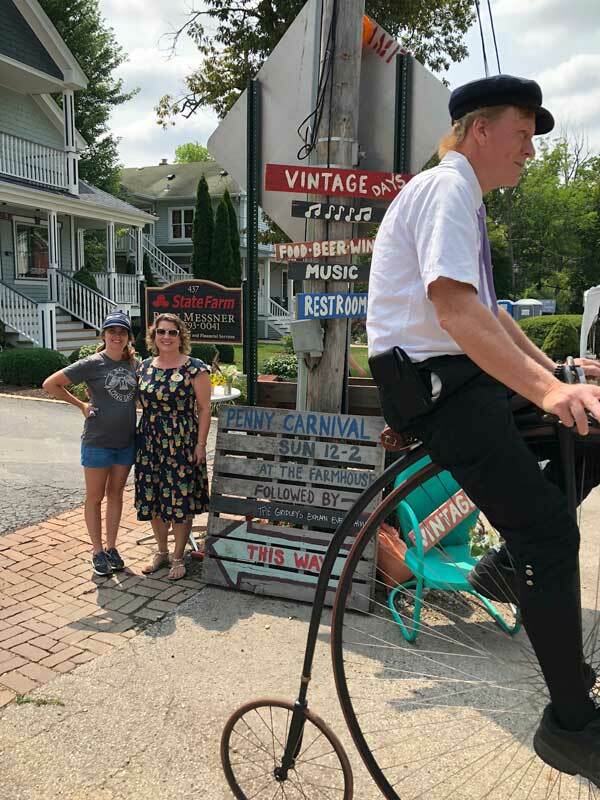 Long Grove merchant and event organizer Meghan Potempa (on the left) and Angie Underwood are photo-bombed in a very cool way at Vintage Days! 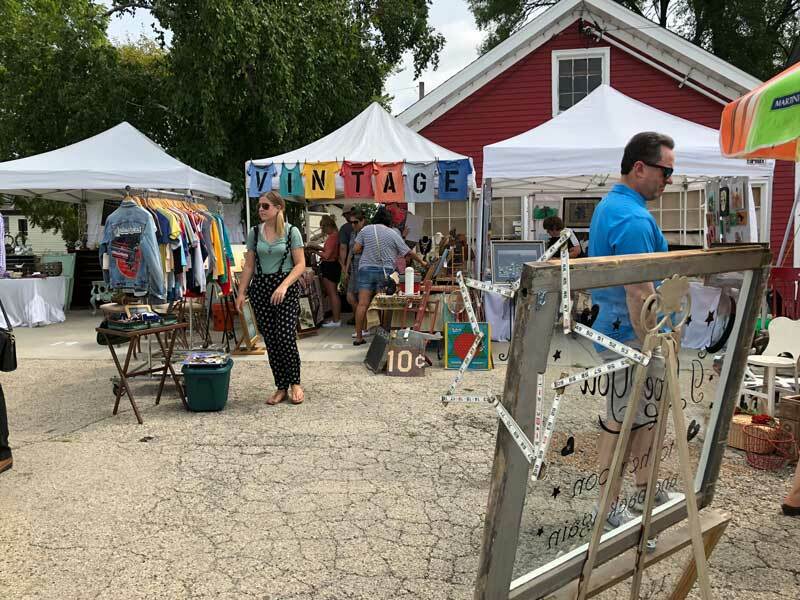 Some of the many booths in the open air market at Vintage Days. On June 21st, Buffalo Creek Brewing in Long Grove marked their first anniversary by hosting a celebration in their 90 seat outdoor beer garden. Dubbed “Muttersholtz Fest,” it featured live entertainment with four bluegrass bands and whole-hog pork slow roasted on site. Pitmasters from Chicago Culinary Kitchen, BBQ’d Productions, and Steamboat BBQ added the perfect spices and sauces to complement the various beers offered, including one called “Muttersholtz.” Now a village in the Alsace-Lorraine region of France, Muttersholtz was the town that many of the early settlers in Long Grove originated from. Back in the 1840’s this region was part of Germany, and with Buffalo Creek specializing in many German style beers, what better way to tie the history and hops together. Congratulations to Buffalo Creek on your first-year milestone, may you celebrate many, many more in our Village! The Long Grove Lions Club was the beneficiary of funds raised at the Muttersholtz Fest event. Pictured are Lions members Jesse Visconik on the left, and John Kopecky on the right. Working the volunteer lemonade/lemon cookie stand are (L to R): Angie Underwood, Long Grove Historical Society President, Laurie Wilhoit, Caring Women’s Connection President, and Karen Korenkiewicz. Merchant Rachel Perkal, owner of Epilogue, gets kudos for the most clever marketing idea by inviting Young at Heart Senior Pet Rescue to be her charity lemonade stand recipients. All afternoon we got to watch pet parents bringing their furry children for a visit to our dog-friendly historic downtown to support pet adoption. Epilogue was packed! So when life gives you lemons, remember the Long Grove prescription: shopping, cute dogs, and lots of lemonade. Harpeth Rising created beautiful music on Towner Green during their Sunday, July 22nd outdoor concert. The Long Grove Arts and Music Council is once again sponsoring free outdoor concerts in Long Grove. I look forward to this opportunity all year, when we can enjoy the out-of-doors and great live music at the same time! The concert series is a bit shorter for 2018 with only four performances, but you can still catch the finale this coming Sunday, August 5th. The April Verch Band will kick off the entertainment at 4:00 on Towner Green in downtown Long Grove. Be sure to bring your lawn chairs or a blanket, snacks and drinks or money to purchase them and support the all-volunteer, non-profit Council at the concession tent. This will be your last chance of the season to purchase a loaf (or two) of “Jane’s Bread.” This locally famous homemade dessert treat is baked by Arts and Music Council member Jane Primack, and serves as a popular money maker for the group. Jane’s creativity has resulted in a bevy of delicious flavors, with double butterscotch and banana chocolate chip being two personal favorites I can recommend. Under the direction of new Artistic Director Ethel Berger this year, many thanks to the dedicated group of residents who are carrying on the tradition of providing free cultural enrichment for another summer season. If you are in Long Grove this Sunday, take advantage of this musical gift to the community!